They are simple to wear. You can add just about anything to them – jewelry, a scarf, boots, yourself. When I was chosen to shop for a dress at Old Navy as a member of the Old Navy Style Council, I was beyond thrilled. After all, I would be in my element (shopping) and I would be getting a bargain (free). This is a girl's dream. I visited my first Old Navy store last week. I had a few minutes to spare, so I decided to browse their selection of dresses to get an idea of what I would to purchase. There were various styles to choose from – belted, maxi, sweater, fit & flared, colored, striped. The choices were endless. 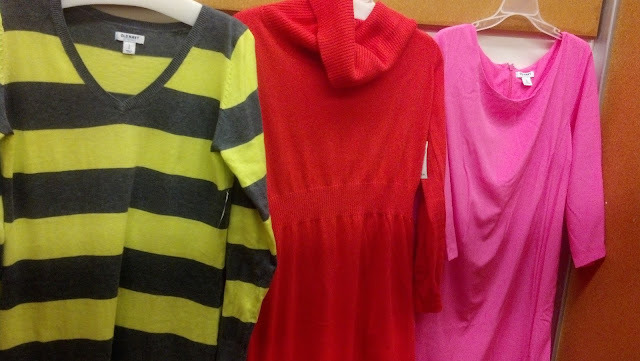 I settled on three dresses. 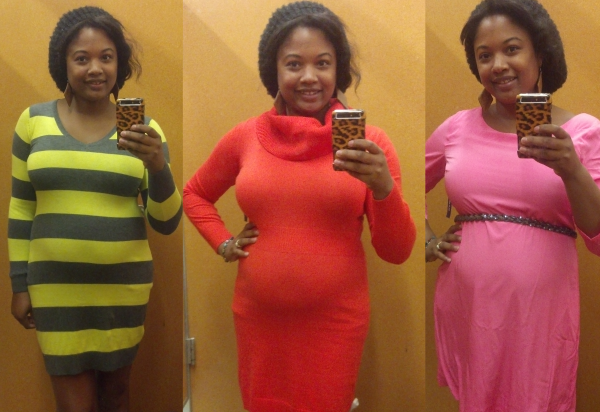 The first was an orange, cowl-neck sweater dress. The second was a hot pink crepe shift dress. 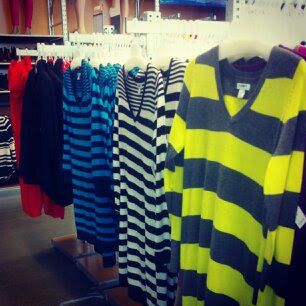 The third was a gray/neon yellow v-neck striped dress. I headed to the fitting room to discover my fate. I should mention that I do not have a normal waistline at the moment. 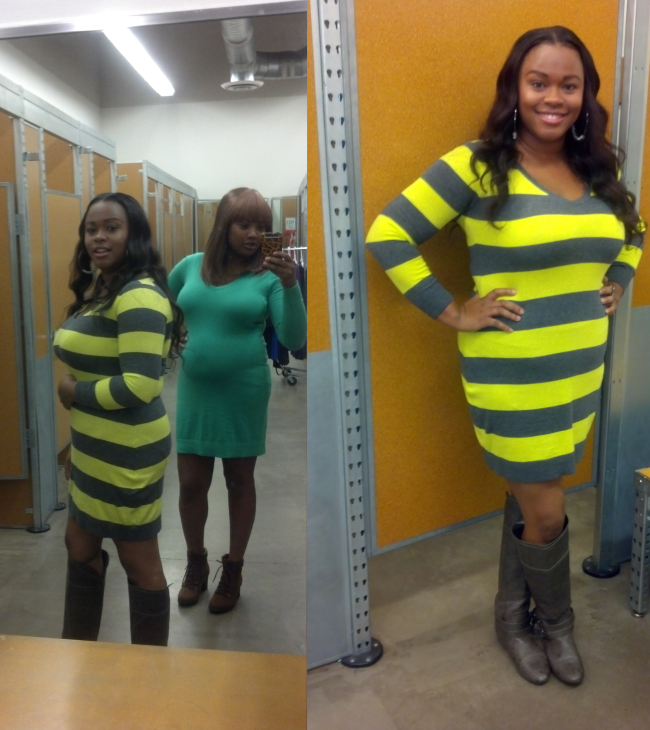 My "precious cargo" forced me to go a size up while shopping for a dress. I was delighted to see that the dresses accommodated my expanding waistline and still maintain a stylish look and feel. I posted the picture to my Instagram (http://instagram.com/keonte) to poll my friends and followers. Their opinions were mixed. There was a like for each dress. I just could not decide. 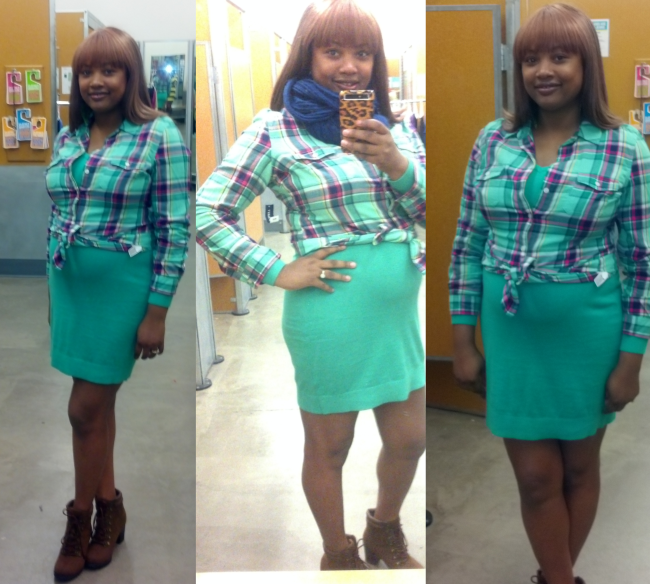 As you can see, I love Old Navy! It's great to walk into your local store and the staff remembers you. The manager at the Annapolis location is always so welcoming and inviting when we stop in to shop. We spend a great amount of time picking our selections and trying on clothes. Yesterday was no different. After browsing the racks, I decided upon a few items to try on. Here is the first outfit I chose. It was my take on a feminine lumberjack. I chose the v-neck sweater dress, with a plaid shirt, a scarf and a pair of boots. The second dress I chose was a popular one. In both stores, the selection was slim. I knew that if I wanted to get it, I better try it on and see if it was meant to be. The dress I chose was the belted 3/4 sleeve dress in black and white stripes, paired with a pair of motorcycle-inspired black boots. I decided to go with the black and white dress. For one, it's classic. I can add so much color to it. It also has a lot of stretch. This makes any woman happy. The belt is a bit too small for me, but I can easily change it. I like the length of the hem and the sleeves. Overall, it's the perfect dress for me. My cousin decided to choose the dress that I previously tried on. I liked it much better on her. 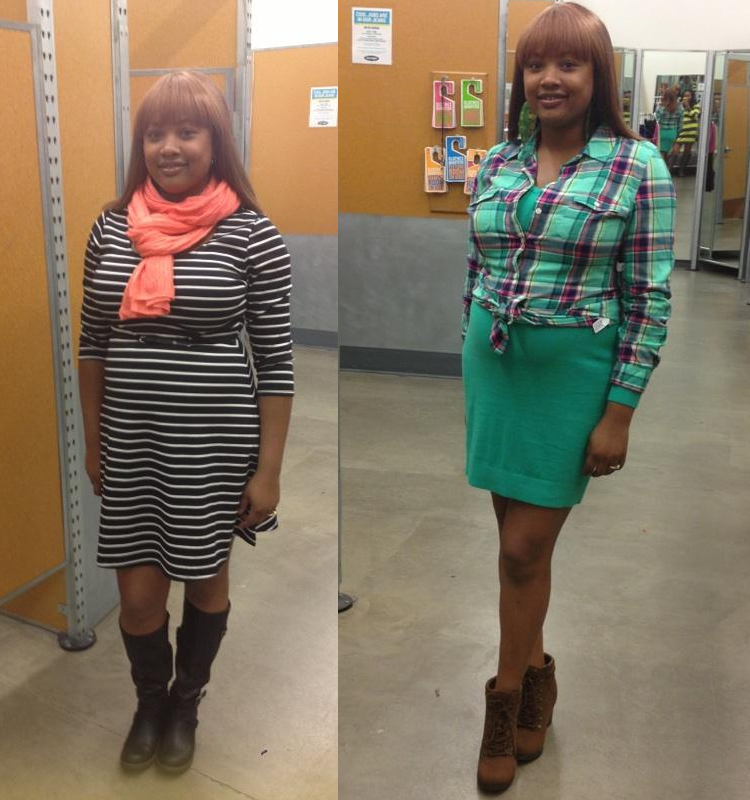 She even had a great pair of Old Navy boots from years ago that she wore to the store that day. While the whole yay-I-get-a-free-item aspect is great, I never stopped to realize just how much fun I have spending time with my family while shopping. 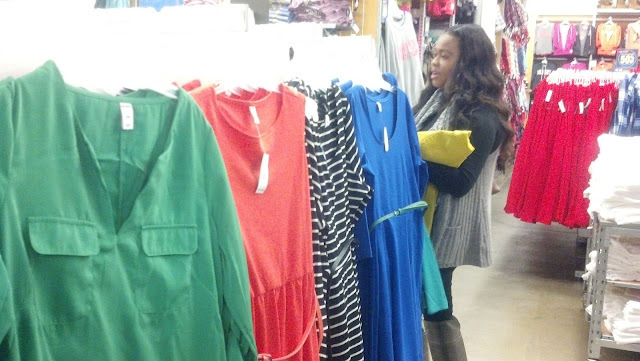 I can't tell you how much we caught up on while we shopping for a dress. We laughed...a lot. It was therapeutic. 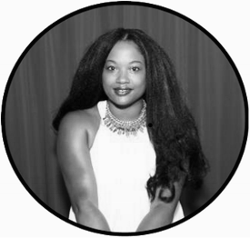 I am always grateful at the opportunities that I am given as a blogger. No matter how big or small, if it fits my life somehow, I'm going to share the experience with my readers. 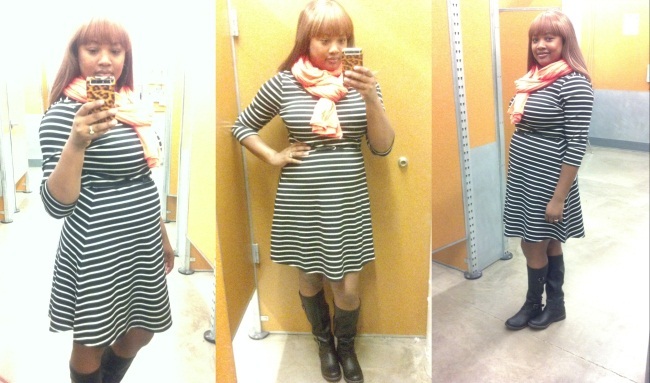 Shopping at Old Navy has been something I have done for years. And I'm pretty sure that is not going to change any time soon. If you're looking for great opportunities to work with brands like Old Navy, why not join Crowdtap? Here is my referral link: Join Crowdtap!! 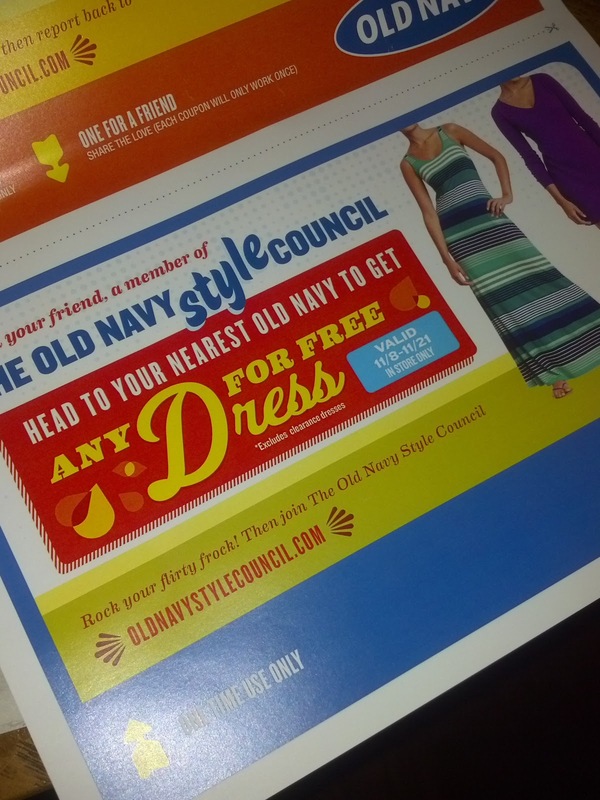 I was provided two coupons (one for me, one for a friend) to shop for a dress at Old Navy thanks to Old Navy and Crowdtap. The opinions and views are my own.